In view of its exceptional expertise in active and passive safety systems, the company sees itself as a key driver in reducing the number of traffic-related fatalities, injuries, and road accidents through the more widespread use of innovative technologies. “We have been pursuing the long-term strategy behind Vision Zero for many years now and through innovations and the ongoing improvement of components and systems we are making a decisive contribution to greater road safety. As we see it, Vision Zero will be achieved in three steps: Top priority goes to eliminating all road-traffic fatalities, then comes reducing the number of persons injured to zero, and finally we need to put an end to road accidents,” says Frank Jourdan, Member of the Executive Board of Continental AG and President of the Chassis & Safety Division. Vision Zero has now also been adopted as the strategic target-positioning for external communications for the Continental premium tire brand in the replacement passenger tire sector in the EMEA region (Europe, Middle East, Africa). Needless to say, the goal of achieving the best braking performance in each class remains unchanged. Vision Zero simply adds a new dimension, starting at the 2015 International Motor Show (IAA) in Frankfurt and taking the goals of the Tire Division forward in a way that is both logical and uncompromising. In Continental’s view, over recent decades marked improvements in safety levels have been achieved through the introduction of mandatory equipment levels for new vehicles, including technologies such as ABS, ESC, TPMS, and AEBS. At the same time, however, statistics (not just in the 28 EU member states) show there are still far too many accidents taking place and too many people being killed or injured on the roads. By way of illustration, the goal of the European Road Safety Charta of halving the number of road-traffic deaths between 2000 and 2010 was not met by a substantial margin. 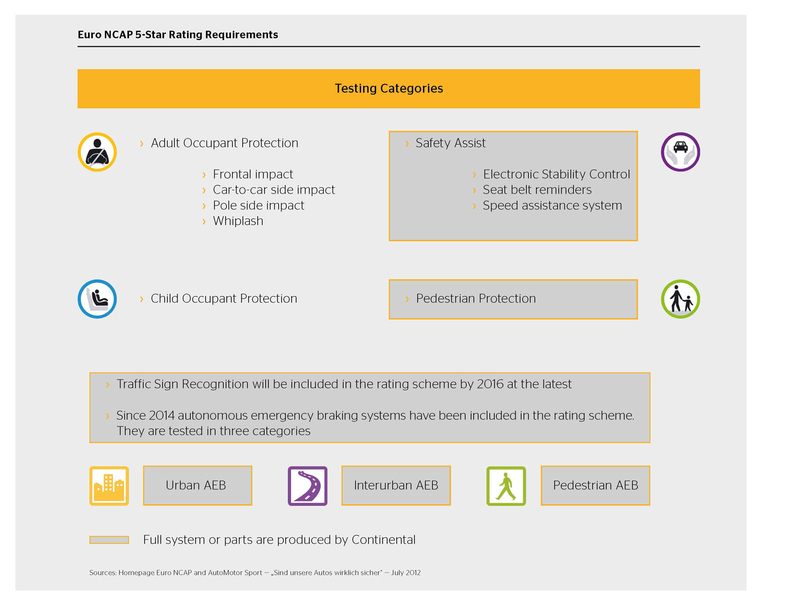 Continental is convinced that raising safety standards, for example by prescribing the use of existing volume-built technologies as standard equipment — not least when awarding Euro NCAP stars in the compact and sub-compact vehicle categories — would make a major difference, not only in Europe but all over the world.